F.E.A. globally supply complete cattle lines, integrating the design, manufacture, installation and the commissioning. 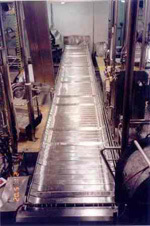 Our cattle processing floors can run anywhere from 5 per shift up to a capacity of 100 head per hour. All our systems are designed to meet individual client requirements. We have the capability to build all equipment in-house giving a clean, pleasing and marketable appearance. Our system offers trouble free operation with minimum amount of maintenance required. F.E.A. system’s are designed to AQIS, USDA and EU regulations. After 30 year of Middle Eastern and South East Asian experience, F.E.A. are specialists in the Islamic market place. 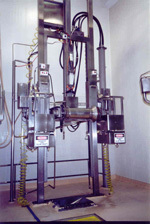 These systems incorporate our Ritual Casting Pen, designed and manufactured by F.E.A. in the mid 1980’s. The Ritual Casting Pen is designed to give 135° rotation. The sequence of operations is carried out via hydraulic hand valves located at the ritual end of the Casting Pen. The operator manually controls all operations. The animal is then released and exits the Ritual Casting Pen onto the Dry Landing Grate. 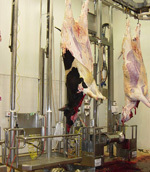 The Ritual Casting Pen is used for Islamic Slaughter, where as the Knocking Box is used in Non Islamic Cattle Processing floors. F.E.A. offer upward and downward hide pulling machines. The F.E.A. downward hide pullers incorporate a sternum hook device which does not require an electrical stimulation to be used during downward hide pulling. F.E.A. 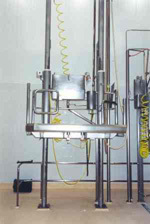 evisceration and inspection systems.